Sekvenskonst: OK Ham and Eggs! Here's the follow up to the last post! 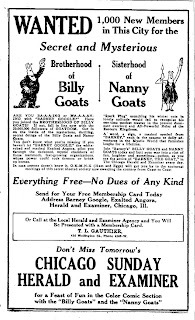 Back in 1928 he was elected The Mysterious and Secret Brotherhood of Billy Goats president candidate and ran for it. And there was coverage in the newspapers, like Barney was a real person! In addition to the last posts membership card (wich I won on eBay a few days ago) here are some of the ads and two (rather blurry) strips from the beginning that year. Just to show some of the newspaper coverage. First off is an ad from January 21, 1928. Then some strips and ads from February 18-26 the same year. All of this makes me want to read more of the dailies. But the microfilm I've found is too blurry to make it an enjoyable experience. If anyone has a good scource for runs of DeBecks Google feel free to mail me. I'm also looking for Kitchen Sinks collection of the strip. Anyone with an extra copy?